Figure 1. A. SDS-PAGE profiles of total cell lysate (TC) and isolated plasma membrane proteins (PM) from human and rat cultured cells. Lane 1, Human lung cancer cell A549 total cell lysate; Lane 2, Isolated PM of A549; Lane 3, PM of rat REL-6TN cells; Lane 4, Total cell lysate of rat REL-6TN cells. B. Western blottings : Proteins in A were transferred to nitrocellulose membrane and probed with anti-Na/K ATPase alpha1, a plasma membrane marker (Upstate, Clone 464.6)) and anti-lamin B1, a nuclear envelope marker (ab16048, abcam Cambridge, MA). The specific protein bands were visualized by a color metric substrate Opti-4CN (Bio-RAD). C. Densitometry measurement of Na/K ATPase alpha1 signals in B (TC vs. PM). Total cell lysates were extracted by Minute Denaturing Total Protein Extraction Kit (SD-001, Invent Biotechnologies, Eden Prairie, MN). Figure 2 A. SDS-PAGE profiles of isolated total membrane proteins from mouse tissues (T=Total Cell lysate, C=Cytosol Fraction, M= Total Membrane Fraction) B. Proteins shown in A were transferred to a nitrocellulose membrane and probed with rabbit-anti mouse pan-cadherin (ab6529,abcam, Cambridge, MA), and anti-actin by Western blotting. The specific protein bands were visualized by a color metric substrate Opti-4CN (Bio-RAD). Signals of pan-cadherin (a 130 kda plasma membrane marker) were significantly enhanced in total membrane protein fractions. 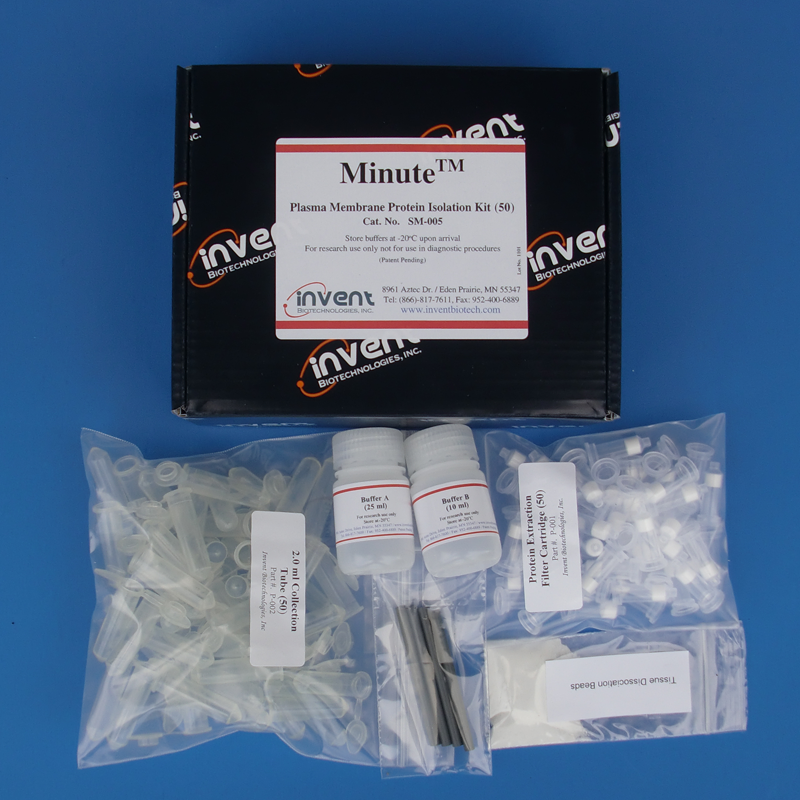 Total cell lysates were extracted by MinuteTM Denaturing Total Protein Extraction Kit (SD-001, Invent Biotechnologies, Eden Prairie, MN). Figure 3. A. SDS-PAGE profiles of total membrane protein fraction (TM) and isolated plasma membrane protein fraction from mouse tissues. B. Western blotting of proteins in A were transferred to nitrocellulose membrane and probed with rabbit anti-cadherin (abcam, Cambridge, MA). The specific protein bands were visualized by a color metric substrate Opti-4CN (Bio-RAD). C. Densitometry measurement of cadherin signals in B (TM vs. PM).